It made me wonder, is there an official high score or world record? How do I compare to others' best scores? Has wave 73 ever been bettered? I always used to play for level progression rather than score. As the note suggests, there are no humans to rescue at this point in the game, it goes straight to the astral plane stage with the skull things. What I remember most is that the game locked on this stage, with everything freezing for no apparent reason. Is the 73rd wave in Defence Force a kill screen, or was it just bad luck? If its not a kill screen (I always assumed the level generation algorithm broke at this point) are there any other known circumstances that cause a lock up? Or anyone who wan't to try to beat your score is welcome too. I'm sure I've got the game audio Image on the laptop to load it...I'll have to check now ??? was that the game you were playing at Byte back? It is, though I've not played it seriously in ages so only got to level 40something there. Well worth a spin if you like Defender clones at all, its one of the highlights of the Oric catalogue. Its not perfect, some of the movement is a little clunky, but given the platform its on and a little time to adjust to its idiosyncracies it turns into quite the playable game. Be warned - the radar is essential, you won't get far without it. In hectic moments it can be safer and easier to watch that instead of the main screen. Also don't forget you have smart bombs. As much as I love my Oric's I agree that it is one of it's best games. I loaded it at Byte Back in Stoke and it got played quite a lot. In one of the few photos I'm in (my own camera packed in en route) I'm playing it. I'm very pleased about that. Didn't you have neat writing as a nipper. 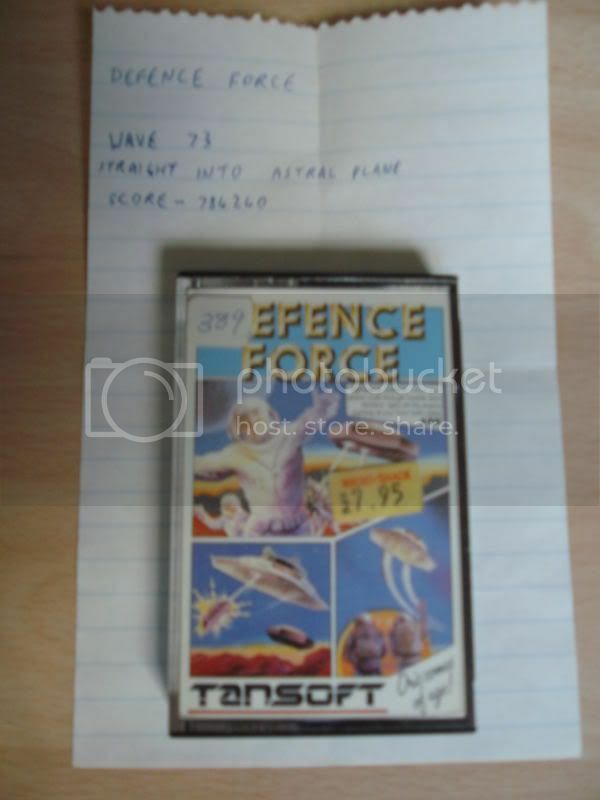 I know its a long time since this thread started but I've just been playing defence force for the first time in about 25 years. In my head I though that I used to be able to reach level 75 after which the game ended. I've just played though and as you say it sticks on the astral plane at level 73 with a score of around 795000.